Wealth Kryptonite sets you on the path to discovering your Wealthy Avatar and paves the way for your journey to wealth. When you understand your Avatar and can incorporate the three-pillar approach of blending emotional, financial and tax intelligence, you move from being an Average Avatar to a Wealthy Avatar. Co-author Ridgely Goldsborough, ESQ. gives a compelling message on building family wealth and provides a path to get it done. Discovering your Avatar is challenging and highly emotional. Ridgely is the co-founder of the WHY Engine, and KnowYourWHY.com the revolutionary marketing and messaging program used by professionals world wide to attract ideal clients based on the company’s WHY. Gail Davis: Today, in studio, we have Ridgely Goldsborough, he was previously on one of the GDA Podcast, which was episode 75. We knew he had a new book coming out called Wealth Kryptonite, and we asked him to stop in, while he's in town today. [00:01:00] So, we're happy to welcome Ridgely. Welcome. Ridgely Goldsborough: Thank you, thank you, Gail. I'm glad to be here. Kyle, good to be talking with you again about some cool stuff. Kyle Davis: Well, you know, as we mess with the mic, thank you for giving me the shout out there. My coffee hasn't kicked in yet, so I'm a little slow this morning. But to help catch people up on this new book and your whole MO as you operate through this space. You're talking about avatars, and when I say avatars, [00:01:30] I'm not talking about the blue people in the movie, I'm talking about something completely different. 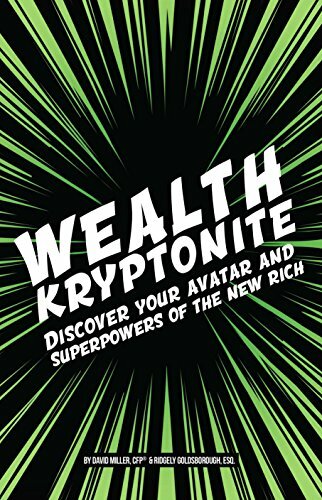 So, if you could explain what the avatars are, what avatars there are available for people to choose from, and then how it plays into your new book, Wealth Kryptonite. Ridgely Goldsborough: Well, let's talk about it in a little bit of an interactive fashion. So, Gail, when you were an infant and you wanted milk, what did you do? Ridgely Goldsborough: Right. And what happened? Gail Davis: I got a bottle. Ridgely Goldsborough: Right. Exactly. And all of a sudden there's an association that's formed that says, "Hey, crying equals success." Ridgely Goldsborough: [00:02:00] So, you wake up in the middle of the night. You're in your crib, it's dark, you're lonely. What do you do? Ridgely Goldsborough: Right. And then what happened? Gail Davis: Someone would come pick you up. Ridgely Goldsborough: Exactly. Right. And then, all of a sudden, that association gets stronger. Crying equals success. And from that moment forward, every single time you needed, or wanted anything. What'd you do? Ridgely Goldsborough: You have any adult relatives that still act like that? Ridgely Goldsborough: Yeah. Just checking. Gail Davis: I was gonna say that crying doesn't work so good when you have two adult sons. Ridgely Goldsborough: Exactly right. So, at the end of the day though, when the caretakers say, [00:02:30] "We're not buying into the crying thing." You still have needs. And you have wants. And you've got to figure out something else to get those needs and wants met. When you figure out whatever that action is. That new behavior. Does it stand to reason that you'll repeat it over and over and over? Gail Davis: If you have success, yes. Ridgely Goldsborough: For the rest of your life. And in that repeated behavior, we can figure out why you do what you do. Why you think the way you think, why you speak the way you speak, why you act the way you act. And each of us does what we [00:03:00] do based on a belief system. You don't get out of bed in the morning unless you believe it's better than staying under the covers. You don't eat unless you believe it's going to take away your hunger. You don't go to work unless you believe you're gonna be rewarded. And at the end of the day, we are a physical manifestation of our belief system. In other words, we are the avatar of our belief system. So, if we move forward from that a little bit. What we did is distill this down into a usable framework to help people [00:03:30] understand themselves, understand how to communicate who they are, so that they can connect naturally from the heart. So, it's kinda like, we'll show you how to read their mind and connect with their heart. And there are seven distinct avatars. All of us have a primary, and then we have a strong secondary. But, in other words, there's a way that we look at the world. There's a lens through which we gaze at everything. There's a chip that manages what we do. And much like gravity, [00:04:00] whether you know about it, understand it, accept it, reject it, it still affects everything that you do. If you were to step off a building after saying, "You know what, I'm done with the whole gravity thing. I reject it." Sorry, you're splatting on the sidewalk regardless. Avatar's the same way, when you figure out your avatar, there is a strength to which you're gonna play all the time, which we call a superpower. There is a kryptonite, or a weakness that is gonna potentially take you down, unless you know how to manage it. So, imagine for a moment that you knew the superpower [00:04:30] and kryptonite of every member of your family. Or, what if you knew the superpower and kryptonite of every member of your team. Then suddenly, you're helping people play to their strengths and minimize their weaknesses. And oh, by the way, everybody wants to play to their strengths. It's where you feel good, it's where you feel empowered. It's where you can be your best, do the most, create efficiently, all that kind of stuff. So, knowing your avatar, figuring out what that is, is super key to leading [00:05:00] both a successful, and a wonderful, a life full of wonder, because you're always playing to your strength. Gail Davis: Do we have time to hit a highlight, brief overview of what the seven avatars are? Ridgely Goldsborough: Sure. Of course. And it'll play into what we're talking about today, anyway. Ridgely Goldsborough: So, it makes a lot of sense. Number one, the giver. The person who just wants to make a difference. Add value. Have an impact. Contribute to others. Great. Wouldn't you want to know who those people are on your team? Yeah, for sure. Right? Ridgely Goldsborough: [00:05:30] Number two, the connector. The connector is all about relationships and bonds. Trust is everything for the connector. Making sure that is the basis of everything they do. They shine in a safe and comfortable environment. And are not comfortable at all if trust is not present. Number three, the problem solver. The problem solver is the person who just naturally comes up with options. And alternatives. They make sense out of things. They clarify things. They simplify [00:06:00] things, and they do it at warp speed. In other words, it's their mode of operandi, they don't have another mode. They have to sort things out. They have to make sense, otherwise they can't exist. So, they're great at problem solving. Number four, the innovator. The innovator is always looking to improve stuff. They're asking the question, "Well, what if this? And what about that? And how about we do this?" They're always looking for better ways of doing anything, tweaking stuff. And it doesn't matter whether it's literally reorganizing the garage, [00:06:30] or setting up a manufacturing plant. They're gonna find a way to make it better. Number five, the perfectionist. The perfectionist understands that there's a way to do things and that things should be done right. There's an A, B, C, D, that if you follow, you can get E, which is a predictable result. All about systems, great people for creating order out of chaos. Number six, the rebel. The rebel thinks differently than everybody else. They live outside the box. They challenge [00:07:00] the status quo. Think Steve Jobs. Think Herb Kelleher. Guys that literally went against the grain, no matter what, to create something disruptive and amazing. And lastly, number seven is the master. The master is the person that just loves to absorb knowledge, information, for the sheer joy of learning, taking in some new things, and then being able to use those whenever they need to. So, those are the seven. Gail Davis: So, you also mentioned that we all have a strength, we all have a weakness. So, are there [00:07:30] seven kryptonites that go with each of those? Ridgely Goldsborough: For sure. Seven superpowers, seven kryptonites. Ridgely Goldsborough: Want me to run through them real quick? Gail Davis: Yeah, I'd love to know. So, the giver, what's their kryptonite? Ridgely Goldsborough: Well, the giver's strength ... Let me go with the superpower first, because usually the kryptonite is the inverse ... It's like almost the direct inverse of the actual superpower. So, the superpower of the giver is causes. They're always working to contribute to causes in some way. Their kryptonite is overcommitment, because they can't say, [00:08:00] "N ... N ... N ... No." Just doesn't come out of their mouth. So, they end up saying yes to everything, because they want to contribute so much to all of these causes. So, they end up either over committed to the point of not getting stuff done, or being so stressed out because of it, because they're like, "Ah, too much on my plate." The connector, strength, superpower, trust. All about building trust, no matter what. Trust is at the top of their list, the challenge is that they're so committed [00:08:30] to building trust, and to demonstrating that they are trustworthy, that they do the extra, then the extra, then the extra, then the extra for others to show that they can be trusted. And the problem is it doesn't work. So their kryptonite is waste. They waste tons of time. The first extra takes them from being ordinary to extraordinary. All of us can aspire to being extraordinary, but all the other extras, they just make them nice. Aww, that person's so nice. [00:09:00] He's so nice. She's so nice. Kyle Davis: It's like they need to understand the law of diminishing returns. Ridgely Goldsborough: For sure, they do. And to figure out that they don't need to do that to prove that they're trustworthy, because they end up wasting a lot of time. The problem solver's strength is solutions. They are so good at rapidly coming up with options, alternatives, possibilities to implement for whatever the problem is. Their kryptonite is paralysis. Have you ever had a team member look at you and they've got the dumb look? They're looking at you, and you know [00:09:30] they're breathing, you can see that they're still alive, but they have this look of like, "I am not present at the moment. I am really kind of like trying to take in what you're saying, but I'm not here." Well, probably a paralysis in a problem solver. If a problem solver doesn't have enough data, they just get frozen. And they need more information to process, to come up with solutions. Number four, the innovator is so good at finding better ways of doing things, they're superpower's improvements. [00:10:00] They always improve everything. But their kryptonite is change for change's sake. Because they always want to improve things, they always have another idea on how to tweak something, even if it's your accounting system that is run by GAP, probably not a good idea to tweak that. Right? You could see the ramifications would be ... And also sometimes, if a team has already come up with a system, of course the innovator's gonna see a better way to do something, but the team is already [00:10:30] secure. They're comfortable. It's working. Cause a lot of morale problems with change. The perfectionist, their superpower is systems. They know that if you do A, B, C, D, you can predict what E is. They live by systems, but their so fixated on creating them, that their kryptonite is rigidity. And, if not careful, they'll take too many monkeys on their back, because people end up saying, "You know what? There's no point in doing anything because so and so is just gonna, just gonna tell us what [00:11:00] to do." And it creates a stifling of creativity on the team, which is dangerous, obviously. Then you get to the rebel. The rebel's strength, their superpower is challenge. They challenge everything. They're gonna challenge the status quo on anything. They're gonna challenge the norm, the convention. And because of that, their kryptonite is isolation. They push people away. Imagine you're dealing with somebody, you don't know they're a rebel, you don't know that that's just their raison d'être, the way [00:11:30] they are. And they challenge you all the time. Well, after a while, you get sick of it. It's like, "Wait, excuse me. Can, can you just agree with something? Some, can I just not do anything right in your mind?" It can cause a lot of friction, which leads to isolation. Ridgely Goldsborough: Lastly, the master. Depth is their superpower, they're always, always going deeper. They want to find out the why. How do the Wi-Fi waves travel through the air, to then get processed through a voice processor in your cell phone [00:12:00] that actually makes your voice show up 3,000 miles away? So, what is their kryptonite? Complexity. They make things complicated. So, these are the kind of people that you often say to them, "Hey, can you just give me the short version? I just want the little, condensed one." Because otherwise, they're gonna complicate stuff. So, there you have the seven. Giver, causes over commitment. The connector, trust, waste. The problem solver, solutions, [00:12:30] paralysis. The innovator, improvements, change for change's sake. The perfectionists, systems, rigidity. The rebel, challenge, isolation. And the master, depth, and complexity. Gail Davis: Okay. I love that refresher. I think I've listened to you three or four times, and I like it better every time. Gail Davis: Because I have a frame of reference. Gail Davis: Having identified the avatars [00:13:00] for different people on my team, now it really resonates. So, I know, I think you've written 15 books, and you're working on your sixteenth? Is that right? Ridgely Goldsborough: That's right. That's right. Gail Davis: So, do all of them talk about the why and the avatars? Ridgely Goldsborough: Only the last five. Gail Davis: The last five. Okay. Ridgely Goldsborough: So, before that it was Prosperity Consciousness. I wrote one novel about mentorship. Ridgely Goldsborough: All personal growth, personal development. The power of belief, that kind of thing. Ridgely Goldsborough: So, related, but not directly. Gail Davis: So, what drove the decision to write a book, taking [00:13:30] the work you've done on avatars, and focusing on wealth? Ridgely Goldsborough: So, I had a client that I'd work with doing all the avatar stuff, named David Miller, out of Atlanta Georgia. Great guy, super genius. Was working with Warren Buffet at age 20. You know, one of these super mind, brain amazing, incredible guys. And one day, he calls me up, and he says, "Ridgely, uh, I got a big idea." And you know, if you know David, when David says he has a big idea, you're like, "Okay, I'm listening. What do, what do you want to do?" He says, "I want [00:14:00] to write a book." I said, "What do you want to write a book about?" He says, "About the avatars and money." I say, "Well, what do you mean?" He said, "Well, do you understand that financial advisors, wealth management people, registered investment advisors, all of them are basically just shrinks?" I said, "No, I don't understand that. I really don't. What are you talking about?" He said, "The money fundamentals never change. If you do A, B, C, D, E, you accumulate wealth. If you don't, you never will. So, what financial advisors do is help their clients [00:14:30] maintain the right relationship with the money fundamentals. "They're basically shrinks, they're constantly counseling them, 'No, that's not a really good idea. That doesn't follow sound principles, we should do this, we shouldn't do that, et cetera.' And if a financial advisor knew the avatar of their client they would know how to help that client maintain the right relationship with the fundamentals of money. If further, you knew the avatar of the spouse of the client, [00:15:00] and you understood the dynamics between those two individuals, how they view money differently. How one might be a hoarder, the other might be a spender. "One might be a giver, the other might be a systems person. One might be a rebel, that thinks outside the box, and the other might be totally uncomfortable thinking outside the box. If you knew all of that, those dynamics, then obviously you could help the clients with much greater effectiveness, uh, to maintain the right, mil, relationship with the fundamentals of money." I [00:15:30] said, "Okay man, you're right. That makes total sense. I get it. So, we're writing a book?" He said, "Yeah, we're writing a book." I said, "Okay. What are we gonna write this book about?" Well, we gotta start ... I think we should cover a broad spectrum. And so, we covered the relationships between the avatars when it comes to yourself. The relationship with the avatars, and money, and your spouse. The relationship with avatars, and money, and your children. The relationship with avatars, money, and your aging parents, and retirement, and all those things. And that ended up being, let's talk about, [00:16:00] "What is your wealth kryptonite?" What is the thing that can take you down, based on your avatar, and the natural way in which you're going to relate to money? Gail Davis: Love it. I love it. So, can ... I think I want to do an example. I know trust is my thing, so does that make me a connector? Ridgely Goldsborough: Yes. For sure. Gail Davis: So, if I'm a connector, and my kryptonite is wasting time. Gail Davis: Help me connect the dots on money. Ridgely Goldsborough: [00:16:30] Okay. So, it's waste, not just money. It's doing the extra, the extra, the extra, the extra. Ridgely Goldsborough: So, let's talk about the connector and money. Ridgely Goldsborough: So, the connector. I'm married to a connector also, so I know. Gail Davis: I remember that. That's why you get me. Ridgely Goldsborough: That's right. You and I get along just fine. I know, I'm like, "Good." If I say, I'm gonna do something, I better do it. Right? So, that starts with that. If someone promises something to a connector, and they don't come through, it hurts. It's not just annoying. It's not just, "Oh man, [00:17:00] that person was lame." It's actually personal. So, if you're a financial advisor, and I'm dealing with Gail Davis, and I say I'm gonna call. Or, I say I'm gonna send an email. Or, I say I'm gonna provide some information, I dang sure better provide that. Am I right? Ridgely Goldsborough: Because if otherwise the trust is broken, and you're like, "Well, I'm going somewhere else. I'm not ... I can't ... The guy can't even follow through, and send me what he said he's gonna send me. Then I'm automatically disconnecting myself from that individual." Ridgely Goldsborough: So, the financial [00:17:30] advisor says, "Well Gail, let's talk about it, what, what, what are you feeling?" And knowing already the connector's usually gonna want to be safe. They're gonna want to play in a comfort zone. They're not gonna want to go too far outside the box, in terms of their money, because, "Hey, wait a second, I worked really hard for that money. I put a lot of effort into making that money, and therefore, I'd like to hold on to it, please." I think that makes a lot of sense to me. Is this sounding familiar to you? Gail Davis: That sounds familiar. Ridgely Goldsborough: Yeah. Exactly. Right? So, [00:18:00] the kryptonite of waste pertains more to how you build trust with others. It pertains more to how many times you go out of your way to demonstrate that you're trustworthy. As opposed to trusting the radar that you, as a connector, have that the rest of the avatars don't have. You have a radar that says, "Ooh, this person can be trusted." Or, "Oh, this person is not so trustworthy." You know what I'm talking about? Ridgely Goldsborough: The spidey-sense that you have. I know, in our relationship, you have been [00:18:30] very cautious about letting me in, growing slowly together. And I, when I found out that you were the connector, I just got it. I was like, "Okay, 'Don't send me long emails.' Cool. She said, don't send long emails. Don't send long emails." Do this. I mean, and those who don't listen to you end up being on the wrong side of your ledger, because of the trust factor. And it happens all at such a profound level. So, someone who's a financial advisor [00:19:00] to you, number one, they better do what they say they're gonna do. They better follow up, they better send the stuff they're gonna send. They better book the meeting that says, "We're gonna sit down and review these things." And then when they meet with you, they better listen, because you're going to tell them how you see the world, and how you want to invest your resources. And then, they're gonna come back to you with facts, and figures, and data, and information that back up [00:19:30] their recommendation, so that their recommendation can be trusted. Otherwise, you are not gonna want to deal with them. Does that sound about right? Gail Davis: Got it. Okay. So, is the book, really, is it targeted to that financial-advisor audience? Ridgely Goldsborough: So, it's targeted to both the end user, so the client, and the financial advisor. Ridgely Goldsborough: Because it covers both sides. Ridgely Goldsborough: The idea behind the book is to help people understand themselves with respect to money. Gail Davis: Got [00:20:00] it. Ridgely Goldsborough: And then of course, provide a tool for any financial advisor to help work with their team. And by the way, it is full of story, after story, after story of disasters. Because everybody wants to read those. Everybody wants to know how did they lose that fortune again? What did they not do that they should've done? Ridgely Goldsborough: How did the perfect ... How did they get disinherited? All those kinds of things. Ridgely Goldsborough: With all kinds of different avatars, and what could've [00:20:30] happened, because you know, we hear these stories all the time. Right? Ridgely Goldsborough: Every day, you hear another story. I was just out in Texas yesterday and I heard a story about a gentleman who left 28,000 acres of land to the state of Texas to be part of a national park, because none of his children followed through on their promise to go out and live on that ranch that he was going to give to them. Gail Davis: So, was he a connector? Ridgely Goldsborough: Couldn't say for sure, but it sure sounded like it. Gail Davis: Sounded like it. Ridgely Goldsborough: I was like, "That sounds like a connector [00:21:00] to me." Because all of a sudden, guess what? They got disinherited because they did not do what they promised to do. And we hear about it all the time. Much better to be empowered, know your avatar, know your strength, and know what your weakness is, so that you can minimize that. Gail Davis: Excellent. I love it. So, when you mentioned that you're working on a sixteenth book, I'm curious where you're gonna go next after focusing on money. What's the next one? Ridgely Goldsborough: So, it's actually all about relationships. And it's about a very specific [00:21:30] type of relationships, which is in this case, JV partners. How do you deal with JV partners? How do you create trust? How do you build relationship with them? What is the way? And writing that one with a very, very powerful online marketer named Glen Ledwell, out of Australia. He is one of the great JV managers of the world. He's like one of the greatest affiliate guys ever. And how does he build relationships? Obviously, understanding the avatar [00:22:00] is paramount. Right? Ridgely Goldsborough: If I know that I'm dealing with Kyle Davis, who's an innovator, then I'm gonna be asking him, "Hey man, how do we improve this? How do we tweak this? What can we do here?" I want to play where he lives. Right? If I know that I'm dealing with Gail Davis, who's a connector, then I'm gonna ask, "Hey, what are your thoughts on ... How can we connect on this one? What, what, what do you think would make this a little bit more secure?" I'm gonna ask questions using keywords from the avatars that pertain to your avatar directly. [00:22:30] Obviously, in JVs, what's the top of the list? Trust. And if you're looking to build an ongoing JV relationship, then trust is even more important, because you want to continue to do business together. To work together. Nobody wants to work with jerks. Right? At the end of the day, sometimes you have to. But, I personally have a life-is-too-short list. And if you get added, then I'm gonna do whatever I possibly can to not really do any business with you. Not because I don't want you to have a great life. Enjoy yourself. But, life [00:23:00] is just a little too short for me to be dealing with whatever that commotion, or that chaos is. Same thing in the JV, the better we understand the partners, the better we understand the avatars, the more that we can then create a great relationship, so that we can do a lot of business together. So, always related to the saying that human condition, that connecting heart-to-heart thing. To me, it's at the end of the day, I find the years ticking by quicker and quicker. Right? And the quality of our gatherings and partings. [00:23:30] You know, life is nothing more than a series of gatherings and partings. We come together, and then we separate. And then we come together again, and then we separate. So, the quality of our life is in such a huge measure, determined by the quality of these gatherings and partings. Well, find out who you are and what you stand for, then I can relate much better to you. The conversations resonate more between us, we play in a space that we're both interested in. And if we understand each other, wow, super powerful, there's no end to how far you can go. Gail Davis: [00:24:00] You know, there are various tests, or quizzes, or surveys that identify, maybe a personality type. Gail Davis: And often, when that information's presented, they say, "The key to building a team is to have a variety." Does the same thing hold true with the avatars? And in business, when you're building a team. Is it ideal that you would have all these? Ridgely Goldsborough: 100 percent. So, imagine for a second that you're looking to create something brand new. I mean, a new product, or a new [00:24:30] service. Which of the avatars do you think would be good for that? Gail Davis: Maybe the rebel. Ridgely Goldsborough: So, now you've got the innovator and the rebel working on a project. Would you, as the leader of that organization, be comfortable with having just the innovator and the rebel work on this project? Ridgely Goldsborough: Right. Exactly. Right? Kyle Davis: But, I am both. Ridgely Goldsborough: Yeah. Well, for sure. Right? Because the rebel and the innovator are gonna come up with incredible ideas. But wait, where's the system that makes this work? Where's the perfectionist that's the engineer type that's gonna come in there and build something? The problem solver, who's gonna sort out the gaps between the stuff? The connector, who's gonna make it trustworthy as a product or service to the marketplace? Of course, you need them all. And if you don't have them, that's a challenge too. Imagine now, you have a team that doesn't have any innovators. [00:25:30] Or, it doesn't have any rebels. Well, your organization's gonna maintain a status quo, but they're not gonna think outside the box. They're not gonna disrupt anything. Maybe that's okay, but it's certainly not optimal. You know, you get someone, and I know from our dynamic that Kyle coming onboard with GDA has been a fabulous thing, because he's bringing in all kinds of new stuff. This podcast came as a result of the innovator joining the organization in a more powerful way. And now, there's a [00:26:00] whole new way that speakers get to communicate their message to the world thanks to Kyle's innovation. So, you have to have everybody. And you know, here's what's interesting. It's not enough to just have all the avatars, it's critical that they understand each other, they understand who they are, and what their avatar is, so that they can communicate better. So they can support each other if there's a kryptonite present. So, they can play to the strengths [00:26:30] of each individual. I have, you know, working with Christina on your team, she's just been great. Her follow-up is so fast. It's accurate, it's on point, it's whatever. And I know, "Okay, this is a person that I want to communicate with on a continuous basis." I know you don't want to be communicated with on a continuous basis, Gail. But Christina does, so I treat each relationship differently, because I understand the avatars. Ridgely Goldsborough: Of course, she totally is a giver. And so, she's so giving, and I'm like, "Hey man, she wants to hear back." She wants to hear thank you. Even if it's just the sixth communication in an email thread. It doesn't matter. And I'm happy to oblige, because I want to have a great relationship with her. Ridgely Goldsborough: In the same way that I'm happy to oblige sending you short emails, because you don't want long ones. Kyle Davis: So, one of the things that you did mention though, is that like, so somebody has like a clear avatar. So, mine being an innovator. Right? But then, you said that [00:27:30] there's like a really strong second. And when you run through the list and when I review it, I'm like, "I'm, I ... Like, I feel like there's like ... My second, they're all close seconds." And I know I joked about being a rebel. I mean, I've been trained to be a contrarian, but like, I'm not a natural rebel, perse. Kyle Davis: But, when I look at it, I'm like, "Okay, innovator, that's one aspect. Perfectionist. You can ask my mom. I'm about systems, process, procedures, don't mess it up. If it ain't broken, don't fix it." Kyle Davis: There's that, and then there's the depth of knowledge. I'm like the weirdest [00:28:00] person ever. I just like learning to learn, because there's that. Ridgely Goldsborough: No, no, Sure. Kyle Davis: I'm just curious as to these hybrid individuals, and how they operate in the space. Ridgely Goldsborough: So, basically, everybody is a hybrid. Right? So, everyone has a primary avatar. And what that means is, you always default to that. [00:28:30] Gail is always gonna default to being a connector. Now, can she put on the cape of a problem solver? If there's a problem, of course she can. She's a very capable individual. She can put on that superpower cape any time she wants. In the same way, you Kyle, are the innovator. And you're always gonna default to finding a better way. Well, you know what? If there's a system in place, then usually that leads to better ways. Ridgely Goldsborough: Oh, by the way, if you have more knowledge that usually leads to being able to innovate. Ridgely Goldsborough: In fact, the innovator is classically known for pulling data, and information, and points of view from other industries. Other places. I know that you listen to a lot of podcasts. Kyle Davis: Yeah, I actually just checked this the other day. I subscribe to 52 podcasts. Ridgely Goldsborough: Right. So, what that means is that you are constantly pulling from here and there and the other place, and you bring it back to your core, which is, "How do I ... Based on this new information that I've learned, innovate something?" Ridgely Goldsborough: "How do I come up with something [00:29:30] that I can innovate?" So, you're constantly doing that. So, do you have a strong element of the master? Absolutely. However, it's in service to innovation. Ridgely Goldsborough: It's in service to being the innovator, which is why we know it's not the primary. And you know what? Here's what I say to people, "What's more important? Accuracy, or impact?" Kyle Davis: Well ... I would say that your impact is great when you're accurate. Ridgely Goldsborough: Of course, [00:30:00] of course. But, impact is more important. Kyle Davis: You know, you could shoot a big gun, but if it doesn't hit. Ridgely Goldsborough: That's right. Exactly. Where I was going with that is we know you're the innovator. Ridgely Goldsborough: So, if your secondary is the master, or your secondary is the perfectionist, I'd rather look at it as, "Hey, I have very strong elements of being a perfectionist, and very strong elements of being a master. I can tap those any time I want to, or need to, and at the end of the day, I recognize that they are in service to being an innovator." I don't know. Um, being a connector. I'm not my mom. Kyle Davis: So, sure. I mean, should someone who ... Once, I mean ... If we're gonna go super meta-zen mode. Kyle Davis: Should people start to focus on their weak spaces? Ridgely Goldsborough: So, let me answer that question, meta-zen like. If you will. So, if you're in search of just rounding out your personality and becoming a more global citizen type, maybe. Ridgely Goldsborough: And I say, maybe. Because, Dennis Rodman never [00:31:30] shot three-pointers. Right? Ridgely Goldsborough: He was really good at rebounds. And therefore, I would say, in terms of success in business, in terms of your relationship with money. Not just know, but hell no. Ridgely Goldsborough: Focus on what you do really, really well. The greatest ... I love this story, where they asked this guy, "What do you do?" Well, basically I'm a garbage cleaner, I clean up garbage. Well, cleaning up garbage in this particular case was capping the oil rigs that were on fire in [00:32:00] Iraq, when the Iraqis set fire to them after the Persian Gulf War. Right? At a million dollars per cap. So, he was really, really good at cleaning up garbage. And as a result of being so focused on being great at what was his strength, then he ended up doing very well. Kyle Davis: So, it's funny. It's like, when we were talking before the podcast about other speakers, and other people, kind of in this space, we were talking about Gary Vee, or Gary Vaynerchuck, or whatever you want to call him. The wise one. Kyle Davis: And he said on his [00:32:30] podcast, whenever you fill out a questionnaire and it says, "What's your profession?" He put firefighter, because he's constantly putting out fires. Kyle Davis: But it's an interesting way of thinking about it. Like, if you're capping oil fields in Kuwait and Iraq, then I guess you're a garbage man. Ridgely Goldsborough: That's exactly right, and I have a friend. A mentor actually. Very, very wealthy guy. And he basically says he hates playing golf with anybody who's worth more than a quarter of a billion dollars. Ridgely Goldsborough: And I said, "Why is that?" He said, "Because they're so busy, [00:33:00] they're always on the dang phone. And you can't really hang out with them and relax." He said, "I like to have my friends be ... You know, quarter of a billion or less." I'm like, "Hey man, you're hanging out in pretty good company no matter what." But I thought that was a really interesting observation. You know? He's got a few billionaire friends, and they're always busy. Like, he doesn't like playing golf with them. So, go figure. Right? We always are gravitating towards our strength. We enjoy playing to our superpower. We enjoy living our superpower. And when we go elsewhere, it's not [00:33:30] that fun. It's not even all that powerful. It's more of a, "Uh huh, oh God." Like, I personally love being a problem solver, but I don't like the details once the problem is solved. I'm happy to have somebody else deal with all of that stuff. And if I have to deal with a bunch of details, it's an agonizing, grinding, yuck, kind of a space for me to hang out. Will I do it? Sure. Ridgely Goldsborough: Can I put on the perfectionist hat and focus on the little system? Yes. [00:34:00] Am I enjoying myself? No. Would I do whatever I possibly can to delegate that, and pass that on to somebody else? Yes, both for personal reasons, because I don't like it, and because it's not me. Ridgely Goldsborough: There's somebody else who will do that better. And enjoy the process. My wife takes care of all details in my world, just about. She loves that. She gets up every morning, goes to her computer. Goes to her to-do list, goes to the top, changes the date from Thursday the 18th, [00:34:30] to Friday the 19th. Has her entire list, prints it out, and checks the stuff off throughout the day. And if she does something that wasn't on the list, she'll go back, type it in, reprint it, and check it off. Ridgely Goldsborough: So weird. Right? Ridgely Goldsborough: You and I are just not relating to that kind of thing. Ridgely Goldsborough: But, let me ask you. Wouldn't you like to have somebody take care of all that stuff for you? Ridgely Goldsborough: So, we make a great team, and she feels empowered, because she is playing to her strength. Kyle Davis: I guess where I was getting at is like kind of in the ... In like health and fitness. [00:35:00] Right? Like, if you're really, really good at running. Your default is always to run. Ridgely Goldsborough: Mm-hmm (affirmative) Sure. Kyle Davis: Because it's where you're comfortable. But then when it comes to like lifting weights, this is a new experience that you're not good at. Kyle Davis: You try it one time. You're like, "Uh, maybe I don't do it." But then, getting comfortable with being uncomfortable, that's kind of where I'm going with it. Is like, you know, should people just shock therapy? What's the word that I'm looking for? [00:35:30] Inoculation. Kyle Davis: Just get in there and go, "Oh, what's it like to be a giver?" You know? Ridgely Goldsborough: So, I mean, you know what? Kyle Davis: Because you're always gonna default back to what you're good ... I mean, then you're always gonna work on that. Ridgely Goldsborough: I think that's fine. I mean, I think it's fine to do that. And so, for example ... But what happens is you're still gonna look at it through your own lens. Ridgely Goldsborough: So, I'm a giver sometimes. As long as it makes sense. In other words, as long as it runs through the framework of a problem solver. Like, for instance, the lawn needs mowing at my house. [00:36:00] I'm not just gonna go out there and mow it, because I can hire a gardener for 15 bucks an hour, or whatever it costs ... I don't even know, because I don't pay them. Somebody else does that for me. That goes to mow the lawn, that economically makes no sense to me. However, if my wife is out there gardening, she loves it if I go out there with her. So, suddenly it does make sense, because now, I'm not about mowing the lawn, it's about giving something to my wife. So, it's still, even [00:36:30] when I'm adopting the superpower of the giver, it's still running through the lens of my avatar. Ridgely Goldsborough: Which it does for everybody. So, I would say, in your personal world, in your trying to be a better person, a complete human being, sure. But, in your profession, or career, or economic pursuits. I'm talking about money, with Wealth Kryptonite. Ridgely Goldsborough: No, why would you not play to your strengths all the time? Kyle Davis: And, coming back to Wealth Kryptonite, and just being financially astute and aware of kind of what's going on [00:37:00] in your life. Are there some guiding principles that impact every avatar for the positive? Or at least, some guiding principles of things to avoid? Ridgely Goldsborough: For sure. Of course. So principle number one is here's what the wealthy do. They make sure that their investment advisor is sitting side-by-side, literally or figuratively. I mean, in other words, maybe it's virtual. With their tax person. It's impossible to make investments [00:37:30] without considering the tax ramifications. And yet, it happens all the time. Robo-advisors, they don't deal with taxes at all. If somebody doesn't know your tax situation, how can they counsel you as to your investments? And the problem is, investment advisors are not legally allowed to give tax advice. So, the wealthy, and the uber-wealthy, what they do is they have a person who's a tax person, and they have an investment person sitting side-by-side in the same room. I would counsel that on every [00:38:00] level. On every level that should be happening. So, investment advice, tax advice, side-by-side. The other side is knowing your avatar. That's the emotional intelligence. So, if you have investment intelligence, tax intelligence, and emotional intelligence, you're gonna have a much greater chance of success. If you know your avatar, you know what your kryptonite is, you can communicate that to your tax advisor and to your investment advisor. And they know. They can talk to you openly, as opposed to trying to psychoanalyze you. If I'm talking to Gail, [00:38:30] and I say, "Well Gail, you know, based on your avatar being the connector, here's where I think this plan would serve you better. And here's where I think it wouldn't." And they're now looking at you as opposed to I am in isolation, speaking about what I the advisor thinks is a good idea. I'm speaking now, taking into consideration who you are, what you stand for, what you believe, and the emotional intelligence that we are actually collectively building. It's almost like there's what you know, there's what I know, [00:39:00] and now there's this third party in the room that's the emotional intelligence that we've created together. And that way, obviously, I think that applies to everybody, having investment intelligence, tax intelligence, and emotional intelligence working in union, I think, is gonna give you a much greater chance of attaining your financial goals. Kyle Davis: I think you said that there was a third one? Or were you saying investment advice and tax advice are two separate things? Ridgely Goldsborough: Those are two. Kyle Davis: Just making sure. Ridgely Goldsborough: I mean, why would you not be able to attain your goals? Kyle Davis: Exactly. And pay your taxes people. It's your rent to live in this fine country. Ridgely Goldsborough: That's exactly right. You know what? That's why you have a tax advisor to help you with that kind of stuff. Stay on top of that kinda thing. Kyle Davis: Gotta make your rent payment. Ridgely Goldsborough: That's exactly right. Kyle Davis: Uncle Sam needs it. Ridgely Goldsborough: Uncle Sam means it, and sometimes that's scary for people. So, if it's a little scary, why wouldn't you get somebody for whom it's not scary? Then they can take that scariness [00:40:00] away from you. It just makes total sense. A, it's the right thing to do, no matter what. It is the due that we have to pay for living in this amazing country. Or any other country, by the way. We gotta support where it is that you live. And, it's intelligent to do that. Get somebody to help you out. Don't go it alone. That way you don't have to carry that burden. Kyle Davis: Well, I think you should probably add a fourth one, and I'm gonna do the cheesy, hooky plug thing. Go buy Wealth Kryptonite. There you go. Ridgely Goldsborough: Thank you. I appreciate that. Kyle Davis: See? Gotta learn to plug the books, man. Kyle Davis: There [00:40:30] you go. Ridgely Goldsborough: You can go find it. Kyle Davis: All right, cool. Well, I think this is a good place for us to wrap up. With that being said, if you would like to book Ridgely for your event, you can do so by contacting GDA Speakers, you know the number. It's 214-420-1999, I said that super fast. But the transcript will have it at GDAPodcast.com. Or you can go to GDASpeakers.com, fill out a contact form and get in contact with the people here at GDA. I don't know where I'm going. It's Saturday morning. I'm done. Thank you. Ridgely Goldsborough: Well, thank you. Gail Davis: Yeah. Thanks, Ridgely. Kyle Davis: That was so good, and Ridgely's [00:41:00] like, "Oh gosh, wow, what a weird ending. Oh well." Ridgely Goldsborough: Live your superpower people. It's all good. Thanks Kyle. Thank you, Gail.